Garlic is one of the most used sautéed ingredients aside from onions. It is an excellent antioxidant and an addition to the flavor of the dish. You can add garlic in almost all your recipe which adds up to the aroma and taste of the food. In various dishes, head of garlic halve is used in different recipes. It enhances the taste of the food. Separate a clove of garlic from the garlic bulb. You can easily pull one of the clusters using your fingertips. With a sharp knife, you can cut the root edge or the brown top of the clove and slice it with your knife. You can also cut the clove in half in order to quickly remove the skin. Lay the clove flat side down on a chopping board. Make sure that the part of the clove nearest to the center of the head faces from you. Position the knife on its flat side over the clove and push it down firmly. Quickly strike the knife with the heel of your hand until you hear a light crunch. Remove the blade and see if the skin detached from the garlic. Using your hands, you can peel off the skin. This, however, needs more practice in order to know how much pressure you can apply. Remove the skin right away after it comes off. Fully submerge the cloves in cold water for five minutes. You can also place the cloves in 1 to 2 inches of water and allow it to rest. Let the water loosen the skins but you can also beat the garlic with a metal whisk to speed up the process. In a watertight container, soak the cloves in and shake the container to remove the skins from the garlic. Finally, delete the cloves from the water and pull on the clove. Cut the edges off to remove further skin if there are any. Remove the cloves from the head. Make sure that you only take the needed cloves. Place the cloves on a small plate and microwave it for 5 to 10 seconds. When they heat up, you can observe the skin billowing and loosening. Remove the remaining garlic peels after the process. Remove loose papery skin before beginning this process. In a stainless steel bowl, put the entire garlic head inside. Cover the bowl with another stainless steel bowl and hold both edges are shaking it vigorously. Allow the garlic to clang around for 1 to 2 minutes. When you open the seal, the garlic should be separated with the skin still attached to the clove. Reseal the bowl and shake it until the skins are removed. The skins should fall off when you shake it. Separate the cloves from the garlic head and put them on a dry cloth. This will prevent the garlic from flying off the table. On a cutting board, pound the garlic with a mallet once or twice. This will make it easier to peel the skin. If you don’t want to smash the cloves, you can lightly and firmly hit it. After running, you can remove the cloves from the cracked outer shell and pull the remaining skins. You can also cut the edges to remove the skin fully. Garlic comes in variety when bought in the store. You can see powdered or minced garlic in olive oil. When purchasing garlic bulb, you must choose the fresh ones so it can be easier to squeeze and feel. 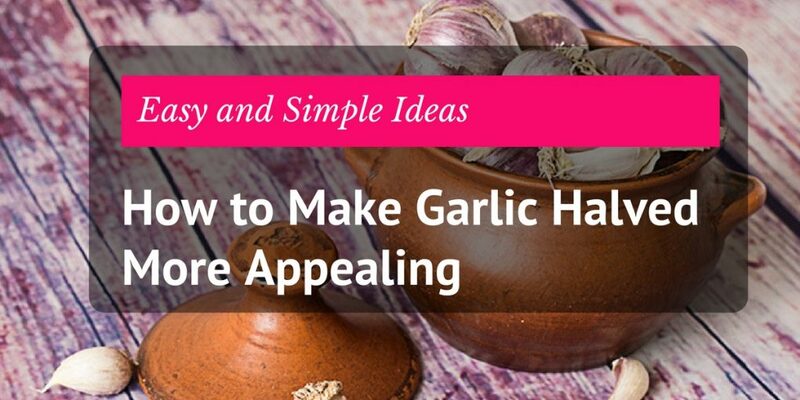 Arrange the garlic that has largely intact taut skin. When the garlic is wet and if it feels more substantial, it is usually the best flavor. Whatever knife you will use, you must make sure that the blade is nice and sharp. This will qiuickly slice the garlic and makes it easier to peel. However, a utility knife is more convenient to use. A sharp knife will allow you to slice the clove without difficulty. This will avoid bruising and damag the clove. When roasting a head of garlic halved, you can set it in a muffin pan. This will prevent the garlic from rolling around. The olive oil will also avoid the roasting garlic from drying. You must, however, choose the thicker product to keep the moisture in. By doing this, the flavor of the garlic will be retained. Cut the garlic along the equator if you are going to roast it. Lay cloves on a chopping board with the pointed end and squat it to the sides. Cut through the equator and try to make the sizes even. When done, it should resemble a tree trunk with the rings visible. When roasting garlic halves, you don’t have to remove the skin. This will enable the garlic to hold and stay in place. When you cut through it, the skins may flake off but you should try to leave as much to prevent from falling off. As the garlic bulb cooks in the oven, the oil and seasoning will retain its moisture because the aluminum foil will seal the juices of the garlic. Thus, you must put the garlic halves on an aluminum foil. You can also add seasonings and flavorings like salt, black pepper, basil, rosemary or tarragon. Spray a bit of olive oil over the exposed cut and wrap it with foil over the bulb. Place each clove in a cup of the muffin pan, facing the open ends toward you. Baking will allow the soft texture of the garlic without the mushy feeling. At 400 degrees, place the pan in the oven and bake it for 30 to 40 minutes. After baking, remove from the oven and leave it covered in foil until it cools down. Expose the lower skin as you completely unwrap it and cut the skin around the clove using a sharp knife. Remove the roasted cloves from the skin with a fork or with your finger. Roasted garlic is an excellent garnish that adds to the appeal of the dish you are preparing. It has a natural caramel color which is highly attractive as a garnish. Garnish your salad with roasted garlic to make it look more appealing and interesting to eat. For your salad, you can just simply rub the interior of your bowl with garlic before arranging your salad. Halved garlic will add up to the flavor of your salad without altering the taste and texture. After that, you can also add some seasonings to the iceberg lettuce and garnish it with halved garlic. In Caesar salad, garlic is also as important as the anchovies. Instead of soaked minced garlic with olive oil, you can try adding the roasted halved clove in your salad. Put the halved garlic in a half cup of olive oil and let it sit for 30 minutes. Remove the garlic and whisk in 2 eggs and 1 teaspoon of anchovy paste until the dressing is creamy. Mix in a quarter cup of lemon juice and sprinkle salt and pepper to taste. Mix 2 ounces of parmesan cheese to finish the dressing. Halved garlic is also perfect for spinach. Rub a halved garlic clove all over the interior of the bowl and the mixing spoon before adding in the spinach salad. You can also remove the skin of the clove and add it to the mixture for additional flavoring. Mix in the spinach, tomatoes and croutons and remove the garlic cloves off the bowl. Make sure to remove all the garlic cloves before adding the dressing. Store the garlic in a dry, dark place with plenty of air circulation. You can also refrigerate it for a few hours before you use it. You can also store it under an unglazed clay flowerpot in a cupboard. Once you have cut the garlic, you should use it immediately so that it won’t lose the flavor. Instead of cutting it ahead of time and letting it sit in a small bowl, it would be better if you cut if right before you will use it. Once the garlic has sprouted, you can replant it and wait until it grows. This will give you more chance to have fresher garlic supply. Plant them in a pot and let it grow instead of throwing it all away. This dish is ideal in spring when the fresh garlic comes. Fresh garlics improve the taste and flavor of the dish which you can roast and eat it whole. Garlic can be served with roasted shallots on grilled bread with the spoonful of goat’s curd or roast chicken. When you cook garlic for long, the flavor becomes softer. If you want a more punchy puree, you can cook the garlic for 7 minutes. You can serve the puree with seared pigeon breast, sliver of salted anchovies on toast, lamb’s kidneys, or lamb instead of mint sauce. Aioli tastes better with pork and lamb. It would be better if you use a food processor or a mixing bowl when making the membrillo. But if you are going to use the pestle and mortar, make sure to melt the membrillo with a bit of water in low heat. This will make it easier to mix the oil. This dish comes best with butternut squash and creamy goat’s cheese with aniseed flavors of tarragon. This will make the taste and flavor of the tart more unique with a twist. The ground almonds will also add up to its nutritious and gluten-free crust. When cooking tofu steak, mix in garlic and leeks to enhance the flavor. Finalize it with banno soy sauce as a dressing to add up to its aroma and flavor. The butternut squash base of this hummus creates a sweet, light dip. It complements the two sweet and aromatic roasted garlic bulbs. The delicious taste of this dish is due to the pre-frying margination of the garlic and palm vinegar. It is cooked crispy and toffee-brown on the outside and sweet and succulent when you eat it. A traditional dish in Korea, maneul jangajji uses garlic cloves as its main ingredient. The cloves are soaked in vinegar brine for a few days before they pickle it in a soy brine. This loses the sour bite and makes it taste sweet and tangy. This Spanish sustaining soup has numerous regional variations. The main ingredients include garlic, eggs, bread, and paprika. Instead of using stems (scapes), you can use a bulb of healthy garlic and a leek for additional flavor and taste. Garlic is the main ingredient in most of the foods we cook. No matter how you cook it, it will not alter the natural taste of the dish. This guide will help you know the basics of peeling to roasting to cooking and baking using garlic halved as your main ingredient. Despite it is pungent and strong smell that usually makes it unattractive, garlic also has numerous health benefits.